Today’s Challenge topic is to tell you all about something funny. I thought it was funny, you might not, but I still laugh when I think of it. It was summer, perhaps June, maybe July of 2001 when I went to the United Kingdom for the first time with my mom, sister, and her husband. Upon landing at Heathrow, I had somehow managed to get Norovirus or one of those nasty bugs which gives you vomiting, high fever, etc. and so we had to cancel our day trip to Hampton Court Palace – a place I had high on my priority list. Oh well, after a few days of agony in our hotel room, I was finally feeling much better. I had missed out on eating fish and chips and several excursions around London, but we all decided it was time to take tea at one of the fancy places. 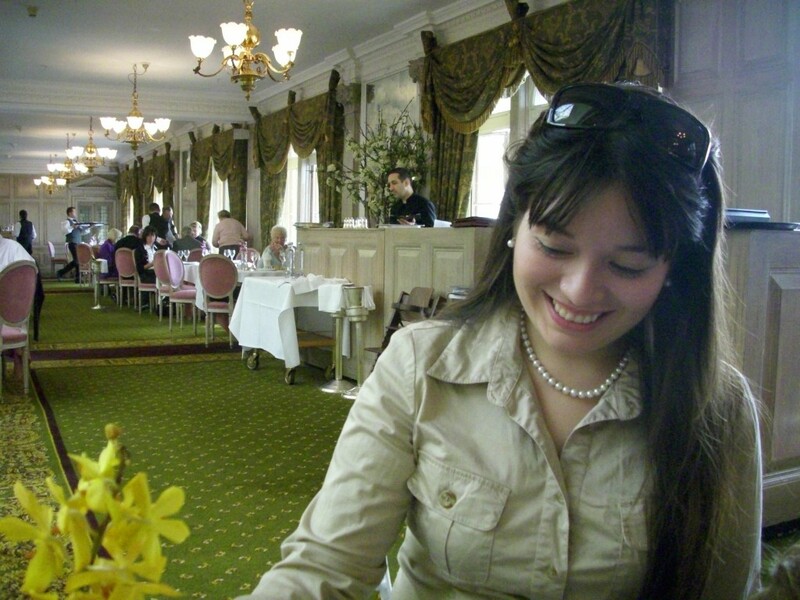 My sister had read that The Brown’s Hotel served an exceptionally good tea, which they did. We arrived and there were a few very elegantly-dressed individuals enjoying the tea and cakes in this dark, lovely room. Three tiers of delicacies were brought to our table, and we were trying to be as prim and proper as possible, since we didn’t want to be the loud, uncouth Americans that people seem to think we all are. Unfortunately, and to my everlasting shame, I did not know how to handle the sugar cube tongs. I gripped onto the golden tongs as I tried to pick up one of the dainty sugar cubes when – SWISH! the cube flies out and hits this guy near us! He was mighty ruffled, though we apologised profusely. The waiter, seeing my horrible faux pas, came over and said that the man was an MP! (Parliament guy). Then we all had a fit of terrible giggles as we remembered what had happened, and we were looked at with disapproval. Needless to say, I haven’t set foot back at The Brown’s Hotel, even though they had a splendid tea time. Never fear, I have fared much better at The Dorchester, The Ritz, Harrod’s and Fortnum & Mason – no sugar cube incidents have taken place at those establishments. I have learned my lesson. No, really, I have. People would love the fac you splashed an MP. We really dislike politicians. Ha Ha,worryingly, there are probably many M.P.s Who would pay good public money to have sugar lumps thrown at them by pretty young ladies ! I blame the public school system.